The green goddess smoothie is a super nutrient boost drink which not only uses broccoli florets, but the stalks as well. In fact you could just use the stalks, saving the florets for something like this quinoa bowl with pumpkin and broccoli. Broccoli is a veritable powerhouse when it comes to vitamins, minerals and soluble fibre. It’s particularly high in vitamins K and C as well as folate. It’s said to boost the immune system, be good for heart health and help prevent arthritis and cancer. It also tastes rather good. Apples not only add sweetness to the smoothie, but they contain lots of beneficial fibre, vitamin C, antioxidants and flavanoids. There’s a lot to be said for the old adage of “an apple a day keeps the doctor away”. A good sized knob of ginger lifts the whole drink and provides a warming spicy glow. Ginger is a fantastic anti-inflammatory but is also good for soothing the digestion and for alleviating nausea. If you like hot ginger beer, you’ll appreciate this ginger green goddess smoothie. CT thought it was very tasty and asked if we could have it again soon. I had a BRITA water filter for many years and used it all the time. It was particularly effective when I lived up country in a hard water area. It removed the mineral scale and stopped my kettle from furring up. After a great deal of use, it eventually broke and I never got around to replacing it. One of the issues I had with it was trying to find counter top space for it to live on. With this new Marella model, this is no longer a problem as its slimline shape means it can sit in the door of the fridge – genius. The Marella holds 2.4 litres. It has an easy flip-top lid for filling direct from the tap and pours beautifully with no dripping at all. It has a clever electronic memo attached to the lid which reminds you to replace the filter every four weeks. All but the lid are dishwasher safe. I found it very easy to insert the Maztra filter cartridge, but full instructions are given. The pastel green jug I was sent is a limited edition, so if you’re into pastels, you might want to hurry whilst stock last. Having said that, there are a range of colours available including new glitter jugs in silver, gold, blue or black – just in time for Christmas. I adapted the BRITA recipe from ambassador Liz Earle slightly, as I found it needed more water. It’s a good idea to use filtered water for drinking. The process of filtering using BRITA MAXTRA technology removes much of the limescale, chlorine and heavy metals found in tap water. It also prolongs the life of domestic appliances such as kettles and most importantly it tastes better. I’m lucky enough to live in an area where the tap water tastes pretty good, but even I noticed the difference – that faint trace of chlorine is gone. It’s just perfect for making my kombucha too. A nutritious and hydrating green smoothie. Packed with nutrients, it's slightly sweet with a warming spicy effect from the ginger. Wash the broccoli, apples and ginger. Quarter the apples and core, but leave the skin on. Remove any tough bits from the broccoli stalk. Throw the broccoli, apples and ginger into a power blender and blitz. If you make this ginger green goddess smoothie, I’d love to hear about it in the comments below or via social media. A photo is always good too. For more delicious and nutritious recipes, follow me on Twitter, Facebook, Instagram or Pinterest. If you like the idea of this ginger green goddess smoothie, why not pin it to remind you later. Post commissioned by BRITA. I was not expected to write a positive review and all opinions are, as always, my own. Thanks to my readers for supporting the brands that help to keep Tin and Thyme blythe and blogging. I am a smoothie lover too, it usually is my post workout snack. I also love having a pitcher of cold water in the fridge, there is something so much better about really cold water vs. cold water straight from the tap. Using Brita to filter that water makes it even better. Smoothies are great for so many things Amy and it’s always good to know that you’re contributing to the overall benefits by using filtered water. I pinned this one! As winter approaches I know I will be needing my greens. It’s a much purer form of smoothie than my usual ones and I really liked it Jamie. It makes a nice change to have one that uses water. So, I’ve never had ginger in a smoothie, but this recipe sounds delicious! I cannot wait to try it, thanks! Ah, ginger is the key to this one, it really lifts and gives it zing. This looks as tho it is super nutrish & and zesty, with the ginger. I bet one feels good after drinking this! It certainly puts a spring in your step and is surprisingly tasty too. Oh this looks just the ticket, I am in desperate need off a nutritional pick me up! I’ll have to dig my Brita out! I know what you mean Chris. I think I need one of these every day for a month to pick me up. A skinny and delicious smoothie! I love the add of ginger in this green awesomeness. This sounds like a great way to start the day. I admit, I’ve never added broccoli to a smoothie before. Kale? yes. Spinach? yes. But not broccoli. I’ll have to try this soon! It sounds good! I love the vibrant colour of your smoothie, I agree filtered water tastes so much nicer. What an awesome sounding smoothie. I love the idea of using broccoli stalks and saving the florets for meal times. I usually save mine to make veggie stock with but will use them for smoothies now. I had a Brita water filter when we lived in England and I’m not sure what happened to it when we moved. I could really do with buying another as I much prefer the taste of water once it’s filtered. Thanks Mel. I have to say I was slightly surprised at how nice it tasted and it’s a great way to use up those broccoli stalks. Moving is such a pain I find, I’ve lost all sorts of valuable-to-me things in the past. I have a smoothie every day for breakfast. Now I know what to do with broccoli stalks! Yay for smoothies. We have them for breakfast more often than not. Love the way you can chuck in all sorts of things I used to throw away – not that I ever threw away broccoli stalks! Yum! I do love a good smoothie, and they can be so much more refreshing with just water. I need to get myself one of those filters, I drink sooo much tap water. Drinking lots of water is a very good habit. It’s one I need to get back into. I love Brita filters! I have one of their kettles which is one of our favourite kitchen appliances! Smoothie looks gorgeous and green! I didn’t know Brita did kettles Kavey, but it sort of makes sense. We use a Brita filter at work it certainly makes a difference to the water. You are such a star with your green smoothies packing in all those vitamins. Well I’d like to take credit Janice, but they are so easy and really quite tasty too. I have been having a fair amount of porridge recently though. 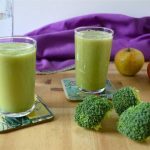 I adore apple and ginger smoothies, but had never thought about putting broccoli stalks in. What a fantastic way to use the bit that I normally end up throwing in the compost! I love the taste of raw broccoli so I’m pretty confident that I’ll love this smoothie. I can’t wait to try it! It’s a very tasty smoothie Sharon, even nicer than I was expecting. I try and waste as little food as possible, so my stalks get used up, but this is a good way to do it I reckon.